Pacific Northwest National Laboratory will manage two field research sites being established by the U.S. Department of Energy to investigate contaminant transport. The research at these sites is expected to lead to new strategies for remediating DOE sites. The awards for these field-scale studies will provide funding to enable large interdisciplinary teams to advance the understanding and simulation of subsurface processes affecting transport of uranium and other contaminants. The sites are part of the Integrated Field-Scale Subsurface Research Challenge, a new program sponsored by DOE's Environmental Remediation Sciences Division. The sites are home to contaminant research previously sponsored by the ERSD, and the program takes it up to a new level by providing support for multi-investigator teams to perform large, benchmark-type experiments focused on pressing field-scale science issues. The field sites are also required to provide capabilities to collect, permit and ship environmental samples of different types to other ERSD investigators and provide site access to those interested in testing specific concepts or technologies/techniques relevant to the study of subsurface contaminant fate and transport. Proposed design of the field experimental plot at the Hanford Site's 300 Area. 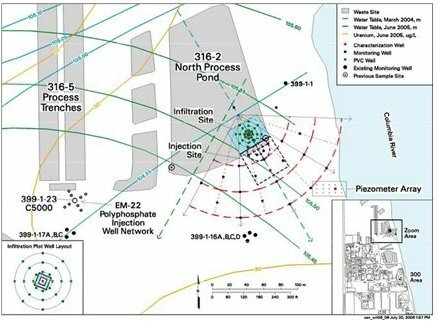 The Hanford Site's 300 Area Uranium Plume. The 300 Area at the Hanford site will be home to one of the field sites. A team of scientists from PNNL, and researchers from three other DOE laboratories, four universities and the U.S. Geological Survey will evaluate four hypotheses related to the uranium plume beneath the site. The plume resulted from nuclear fuels fabrication activities that took place from 1943 to 1975. The four hypotheses will take advantage of the site's unique hydrogeologic attributes, which are representative of numerous other contaminated sites at Hanford along the Columbia River corridor. 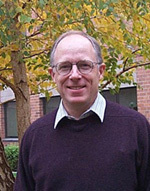 "The hypotheses will focus on multi-scale mass transfer processes in the vadose zone and saturated zone; their influence on field-scale uranium biogeochemistry and transport; and their implications for natural attenuation and remediation, particularly with regard to the longevity of the groundwater uranium plume," said John Zachara, PNNL chief scientist, who leads the research team. "We have designed an innovative monitoring array for in situ manipulation experiments that cut across waste sources in the vadose zone, through contaminated aquifer regions, to final discharge to the Columbia River at the groundwater-river interface." Projected funding for this field demonstration is $1.75 million during FY 2007 and $3 million in FY 2008. Uranium Mill Tailings Site in Rifle, Colorado. The second field study expands on work being done at a Uranium Mill Tailings Site in Rifle, Colorado. There, PNNL geohydrologist Phil Long has been coordinating a diverse team of researchers examining the stimulation of subsurface microorganisms to reduce and immobilize uranium in situ. Acetate addition to the subsurface stimulates metal-reducing bacteria to effectively remove uranium from groundwater. The research has led to three important findings: 1) in situ bioremediation of uranium is possible, 2) uranium reduction activity at this site is associated with microbial iron reduction and appears to decrease with the onset of sulfate reduction, and 3) some uranium removal activity appears to persist long after acetate injections cease. The results indicate that in situ bioremediation of uranium is possible but that significant issues remain to adequately describe and control the process. (A) Location of the proposed Rifle Field Site in Colorado. (B) Map of the site showing estimated uranium concentration in groundwater as of approximately 1998 and location of existing experimental plots on the site. (C) Photograph of the site looking east. 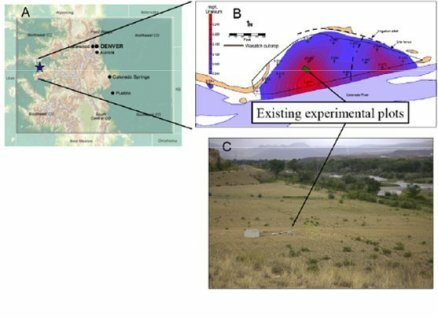 Understanding the coupled biogeochemical processes controlling uranium mobility is critical to the design of optimal biostimulation strategies for prolonging uranium bioremediation. The research team consists of scientists from PNNL, two other national laboratories, four universities, a private company and the U.S. Geological Survey. 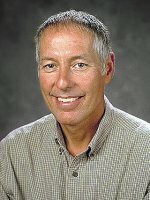 Said Long, "At the new field research site, we hope to understand the microbial factors and associated geochemistry controlling uranium movement so that DOE can confidently remediate uranium plumes." The team will test four hypotheses related to geochemical and microbial controls on stimulated uranium bioreduction, uranium sorption under iron-reducing conditions, uranium stability and removal after biostimulation and rates of natural bioreduction of uranium. "A key part of the research will be the use of proteomics to determine the metabolic status of subsurface microbial populations during biostimulation," added Long. "This new information will allow us to define the relationship between microbial activity and the geochemical changes that occur as a result of acetate addition. Ultimately we will be able to optimize microbial behavior in the subsurface to maximize removal of uranium from groundwater in situ. The new knowledge we gain will then be used to develop effective flow and reactive transport models. These will be major steps toward meeting DOE's environmental remediation goals." Projected funding for this field demonstration is $1.75 million during FY 2007 and $3 million in FY 2008.